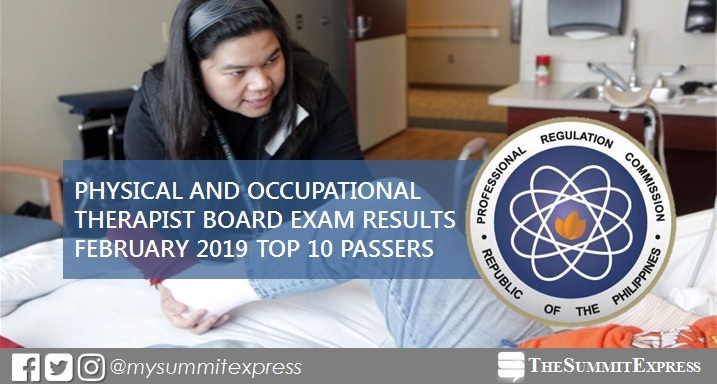 MANILA, Philippines – The full list of topnotchers or top 10 passers in the February 2019 Physical Therapist (PT) and Occupational Therapist (OT) board exam is available on this page as officially released on Thursday, February 7, 2019 or in two (2) working days after the exam. In the February 2018 PT-OT exams, Kevin Ceroriales Bordones of Saint Paul University (SPU) - Iloilo topped the Physical Therapist board exam with 85.75%. Meanwhile, Maria Angela Gonzalez Gutierrez of University of the Philippines (UP) - Manila aced the Occupational Therapist licensure exam with 81.60%. In the February 2017 exams, Stephen Blaise Ilao Hernando of University of Perpetual Help System - Laguna got the highest place for PT exam (88.70%) while Christine Joy Mirasol delos Reyes of UP-Manila bagged the top spot for OT (81.60%). Monitor this page for the real-time updates on PT-OT board exam results. Check out also the official website of PRC for more information.